Mayan Madness is a 3D third-person adventure game that I worked on as a lead developer in the last year of my undergraduate course. 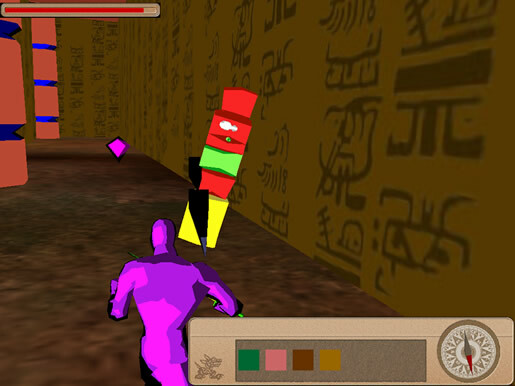 The main goal of the game is to get out of a network of buried Mayan tombs by solving puzzles and collecting hidden keys. There are stone guardians that attack the player by shooting arrows or trying to crush the player. 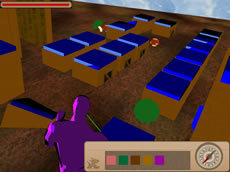 The enemies can be fought in a melee combat with a sabre or by throwing the sabre from a distance. 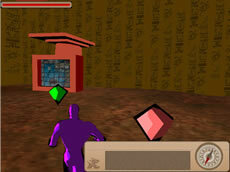 The game was coded in C++ and used Ogre 3D as a rendering and scene management engine. Cel shading was added to give the game a cartoony effect. The development team consisted of two programmers, a HUD developer, a sound artist and a graphics artist. The whole creation process was agile and my role as a lead developer was to bring the team's ideas together, devise the development plan and distribute technical tasks. My main programming contriutions included creation of the basic object class structure, implementation of the NPC behaviour, collision detection and character control code, as well as generally helping with other programming tasks. I also developed a mini jigsaw puzzle game in Flash that was later incorporated into the game and could be accessed through an in-game panel. Stardust Colonies is a strategy game in which player-controlled units are aware of and affected by both their own memory and preferences, as well as by their colony's well-being. The project reviews some of the existing design patterns and available algorithms used in iPhone games development. The application created is a template project for a 2D iPhone game. Space Invaders was one of my assignments in the second year of my Undergraduate study. It is coded in C++ and uses OpenGL and DirectX for rendering. This simple 2D shooter is based on the original Space Invaders game and adds some interesting new features.